“Wow, this was such a great Reading. Thank You so much Ashley.” ~L.M. Chakra is a Sanskrit word, meaning,”wheel.” The human chakras are “wheel-like” vortices that exist on the surface of the etheric human body. At the center of each chakra, in its deepest point, is a stem-like channel that extends to the spine and merges with it; thus connecting the individual chakra with the sushumna (the most important energy channel) which ascends within the spine to the top of the head. Chakras are energy centers. They function like receivers and transformers of the various forms of Qi (life force or vital energy). Through the nadis (network of channels or arteries that transport Qi throughout the human being’s energy system). The chakras take in the vital energy and transform it into the frequencies needed by the various areas of the physical bodies for sustenance and development. 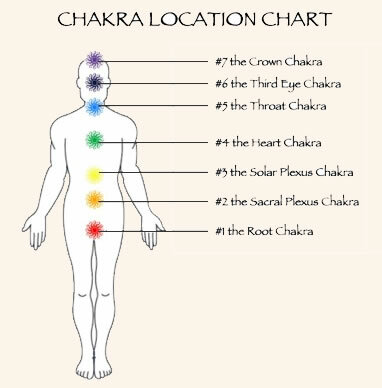 Traditional writings say there are 88,000 chakras in the human body. Most are extremely small and play a minor role in your energy system. However, there are approximately 40 secondary chakras that are of significance; these are located in your spleen, the back of your neck, the palms of your hands and the soles of your feet. Each chakra is connected with one of the elements of earth, water, air, ether, and mind – mind being an instrument of consciousness. These elements are states of matter and NOT elements as we understand them in modern chemistry. They are equivalent to the terms: solid, liquid, fiery or gaseous, airy, and etheric – which are somewhat analogous to the physical, astral and mental planes and sub-planes. The ethereal body is located approximately 2-5cm in front and around your physical body. It is the life force body, because it provides the biological body with cellular genetic guidance. It is not completely separate but interacts and sustains the life of the biological body. There are specific channels of energy exchange, which allow the flow of energy to move from one system to another. This life force energy, commonly known as “Qi,” is supplied to the ethereal body via an ethereal cord that connects to Earth’s ethereal body. Without this ethereal cord, the physical body would die. The electromagnetic energy that flows around the ethereal body is known as “Qi.” This bio energy (sub atomic light energy) circulates around the ethereal body, through a number of tiny web-like ducts, pipes, or channels called “Nadis.” These nadis lines are an extensive network or transport system that connects the ethereal body with the biological body. Qi energy flows through ethereal matter and provides the power and energy to regenerate the ethereal body. This bio energy or “Qi” is the fuel for the ethereal body. It consists of high frequency light that keeps the ethereal body alive to sustain and preserve your biological body. The ethereal energy system or nadis lines connect at special energy nodes called “Chakras.” The chakra energy system consists of twelve (12) chakras or energy centres. There are seven (7) primary chakras, which transport electromagnetic energy by entering and exiting your physical body and five (5) external chakras. The chakras act as an energy transformer – Qi flows through the various nadis lines and are processed and distributed by chakras after the energy is modulated into a different frequency. This energy is translated into hormonal, physiological, and cellular changes in the biological body. The chakras are arranged as an ascending column and start at the base of the spine and finish at the skull. The locations of these seven primary chakras have a direct interaction to the biological body including the major nerve plexus and endocrine gland. 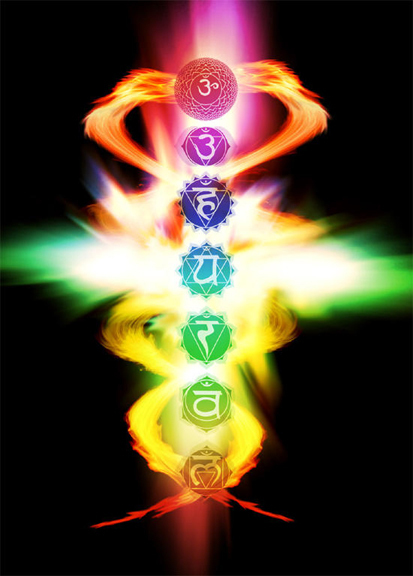 The seven primary chakras are generally associated with specific colors and each has a specific ascending frequency. In various traditions, chakras are visualized as wheels/lotuses/flowers with a different number of petals/spokes in each chakra. The chakras could be termed “non physical organs” that operate on specific frequencies and wavelengths, and connect the biological body with the ethereal body. Chakras are more like swirling vortexes of electromagnetic energy. This energy moves through them like water flows down a funnel. By alternately spinning clockwise and counter clockwise, our chakras maintain a dynamic balance between receiving and building energy (done through the clockwise motion) and releasing excess energy (done through the counter clockwise motion). The chakra system influences your biological body through the endocrine glands. Each chakra is associated with a different endocrine gland. Just as there are seven chakras, there are seven endocrine glands. Both the chakras and the endocrine glands are located along the front of spinal cord. The endocrine glands manufacture hormones and supply them to the bloodstream. When a chakra is damaged, it causes disruption to the function of its associated endocrine gland. Because the activity of the endocrine glands and nerve plexuses are interrelated and interdependent, when an endocrine gland does not function properly, it influences the entire biological body. Chakras are like magnets and that is the main reason for their blockages (energy transference), the lower chakras operate on the lowest frequency, so they automatically pull or attract the denser (heaviest) electromagnetic energy. When the primary chakras are not functioning correctly, the physical body will vibrate at lower frequency. Chakra healing is a straightforward process requiring nothing more than your conscious intent and visualization skills. When you open your chakras, you are essentially “powering up” your ethereal body. Chakra healing removes unwanted frequency, which allows the chakra to function normally. After healing each primary chakra, there is a symbiotic frequency increase within the ethereal body. When most of the primary chakras are healed, and the system is realigned and balanced, the flow of Qi energy is naturally restored. Working with the Subtle Energy Field’s that are within and around our bodies, DesertStar Healing facilitates the Balancing of Physical, Emotional, Mental, & Spiritual Energies. We live in a sea of energy. Everything is energy. Matter is nothing more than energy vibrating at a very low and fixed rate in a cohesive pattern. The human body is simply a complex network of energy patterns which interact with each other and with other energy patterns.The body is composed of energy vibrating at certain rates, existing in a specific form, solid matter. Everything vibrates. All matter, regardless of size, produces a magnetic field. Magnetism is a form of energy. Thanks to the advancements in quantum physics we now understand that magnetism is one of the fundamental forces of the universe. The human body, being comprised of compressed energy, has mass and therefore a magnetic field. The human body also has another important characteristic: it is comprised of a series of electro- chemical reactions. For example, respiration (breathing) is a chemical reaction. Signals to cause muscles to contract and release are carried through electrical signals. Information is transferred throughout the nervous system by a series of electro-chemical reactions. Energy is neither created nor destroyed, only the form changes. Since the human body has mass it produces a magnetic field. In addition, the body is driven by a series of electro-chemical reactions. The interaction of the resulting fields (electric and magnetic) combines to form what Western science now terms, “The Bio-Energetic Field”. The bio-energetic field surrounds the body and varies in strength and density. It has been measured to extend between an inch and three feet from the body. Many Eastern schools of thought and cultural traditions have long known of the existence of the energy field which surrounds the body and have discovered it uses. Western science is finally maturing to the point where it too beings to grasp the importance and uses of the energy field which surrounds us. This field, known to many traditions for long periods of time, is called The Aura. The Aura is the energy field which surrounds our body and interacts with forces within our environment. This energy field has several different functions. The aura regulates the amount of energy within our system, it serves as an advanced contact system with other energy fields, it can be used in the diagnosis and treatment of illness, it can be strengthened to provide a means of defense, it can be used to extend your awareness and make you invisible and can even be used in an offensive manner if the need arises. These are but a few functions of the aura. The aura has been visible to those with the “sight” as long as people have possessed this ability. The auras of some people have been visible to those without the “sight”. These cases usually involved people who were filled with energy or very passionate about something. Strong emotion tends to strengthen the aura and can make it visible to the untrained eye, especially when observed against a dark background. The primary function of the aura is to regulate the energy within the body. The regulation of energy is accomplished through a series of energy transfer points called the Chakras. The chakras perform the actual work of regulating the energy. However, it is impossible to separate the chakra from the aura as it is the chakra which helps to form the aura. Classical thought maintains that there are seven major chakras, or energy transfer points, on the body. Each chakra is located in a specific area, has a specific name and a specific set of functions. 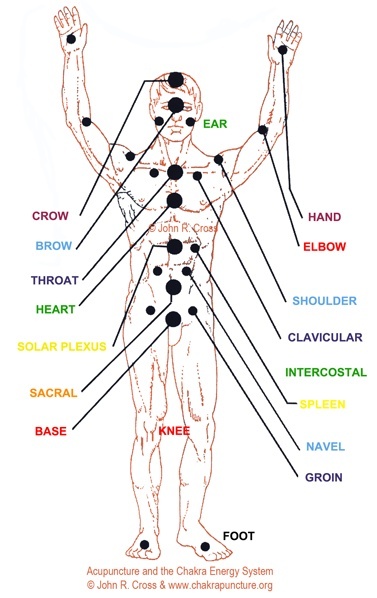 In addition to the seven major chakras there are twenty one minor chakras which correspond to the twenty one major acupressure points on the body. 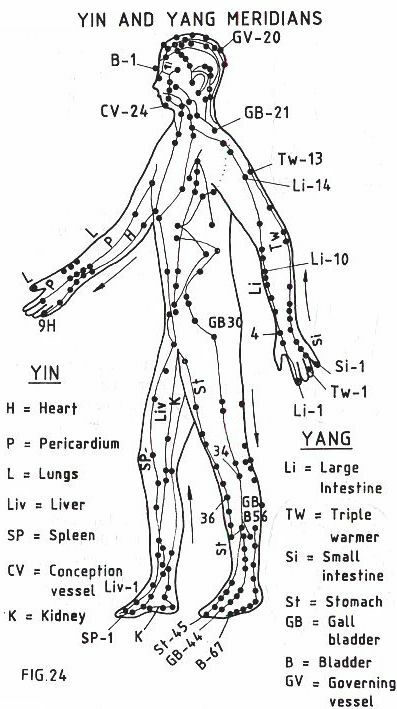 There are over 120 additional chakra points scattered across the body which also correspond to acupressure points or nerve bundles. A new school of thought is just beginning which maintains that along with the seven major chakras there are twenty five additional majors for a total of thirty two major chakras. The major chakras are located along the spinal column. The chakra appears as a cone of clockwise circling energy (depending on the direction of view). Each chakra has two components, a front section on the front half of the body and a back section on the back half of the body. Inside each chakra are smaller cones. Each chakra has a front and back component which meet at the center of the spine. The root and crown chakras also have “front and back components.” Each chakra has a specific function that is tied to a different auric body. 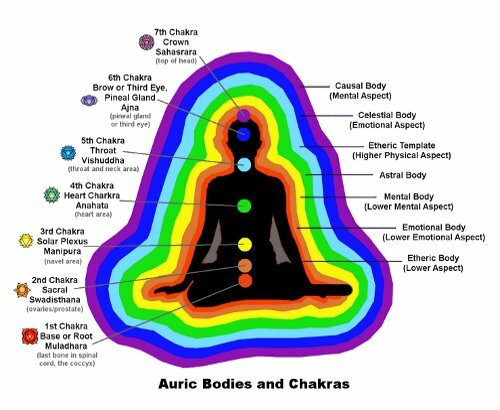 The auric body is made up of several layers, one layer for each chakra. Each one of the auric layers is governed by a specific chakra but all the chakras exist on all layers. There are seven auric layers and a total of 56 chakras manifesting on all seven layers and the physical body. The first auric layer is the Etheric layer. The etheric layer is closest to the body and fits nearly like a second skin. It has a definite size and shape. Generally, it extends from 1/4 of an inch to two inches from the body. Lines of energy are readily seen in this section of the aura since it is most closely linked to the physical body. It usually appears to “sight” as a blue or gray light or haze. The second auric layer is the Emotional body. This layer deals with emotions, emotions with us and emotions we have for other people. The emotional layer is often seen as a swirling mass of energy about the body. The form pretty much approximates the human shape but is not as defined as the etheric layer. In fact, each layer out becomes less and less structured as a physical person. The third auric layer is the Mental layer. This is the layer of thought and ideas. The layer where concepts are fashioned into reality. It usually is most visible around the head and shoulders as a yellowish light. It is in this layer that thought and ideas actually become substantial. The fourth auric layer is the Astral layer. The astral layer marks the division between the physical layers and the higher layers. This layer is responsible for interaction between people. It is the layer of love and of relationship. Emotional bonds are formed on this layer. The fifth auric layer is the Etheric Template. This body is a copy of the physical body on a higher level. It is the “master” copy for the Etheric body to model itself after. The sixth auric layer is the Celestial body. It is the body of emotional level on the spiritual plane. Through this layer we are able to commune with Spirit. It is the level of unconditional love and trust. The seventh auric layer is the Ketheric Template, also known as the Causal Body. This is the mental layer of the spiritual level. Through this layer we can become one with the Spirit. Through this layer we can access the akashic records and delve into our past lives. It is the layer of true connectedness to the higher planes. Take this time to organize your thoughts and visions. Logic will guide you in the right direction. This will lead to balanced structure and discipline. You have the knowledge and experience for leadership. The Sun is on your side- brilliant new ideas will give rise to great successes in life. The work you’ve done spiritually and personally brings astonishing changes to your life. Have Confidence. Connect with nature to assist in clearing your mind, focusing your thoughts and realigning your emotional and physical body. New career opportunities will reveal themselves to you. Material or karmic debts are paid off. You have the power to manifest the abundance that awaits you. Focus on the things you do have instead of what you do not- Law of Attraction. Accept the help being offered from others. Enjoy in what life has to offer. Spend time in meditation to regain strength, clarity and focus. Use knowledge and skill to attain success in self-employment. You have come full circle and have evolved to a whole new level of understanding of the Universe- you are well on the path toward Enlightenment. Joy, contentment, and gratitude surround you. A new home or job is possible at this time. You see humor in any situation. There is a need for objective decision making. Utilize this time to clear away that which has allowed you to grow and no longer serves you. A sense of new beginnings when it comes to love; a new romantic partner or the renewal of an existing relationship. Moving to a new home is on the horizon. 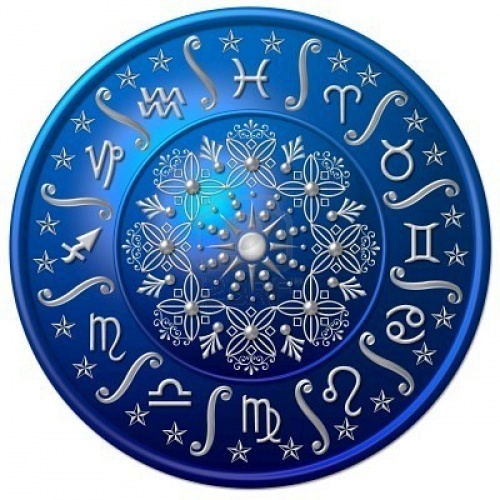 Your intuition is highly accurate at this time- listen to it. Open your heart and mind to those around you. You may be inclined to volunteer in doing some type of charity work. There is an opportunity to give or receive trustworthy and heartfelt advice. Good news is on its way to you- a promotion or new job offer. You’ve made wise decisions and have worked hard. This is a time of great achievement and success. Possibility of public recognition or awards. It’s time to review your plans and look at things from a different perspective. Sense of change in job, career, or relationship. These changes will bring the benefits that you desire. Don’t let anything distract you from your true path. There is a need to move forward in search of something more meaningful. Spiritual and emotional growth- evolution. Embrace your unique and eclectic beliefs and attitudes. Clear your mind and collect your thoughts- a compromise is called for. Trust in yourself and be accepting of the situation before making a decision. Attempting to fight the current does not benefit you or anyone else involved. Focus on the positive. You are surrounded by those that are able and willing to be supportive. Take comfort in knowing everything is working toward your higher purpose. You may feel as though you are reaching new heights. Focus upon work that involves your passion. Creativity will open doors to new possibilities. Received recognition for high quality work enables you to regain self-confidence. Possibility of joining a group or organization at this time. Illumination of a situation- believe in yourself and take action. The walls of illusion will not allow you to move forward. You possess the ability, power, and strength that will see you through. Surround yourself with positive thinking and others that can help you to see the possibilities. Physical, mental and emotional balance is needed. Yoga, meditation, or tai chi may help you find harmony in all things as well as a sense of inner peace. Look upon challenges as opportunities to learn and apply your knowledge. You are stronger than you realize or give yourself credit for. The strength that this situation calls for comes from the compassion and kindness of a spiritual core. Creative and inspiring career possibilities are coming into view- starting a new business, job offer, or promotion. Embrace life changes and new adventures for it is not only opportunity that awaits you. Wise beyond your years. You tend to be very optimistic but realistic about what can be accomplished. Possibility of returning to school, continuing education; adopting a new interest or passion. If you are considering life changes refrain from acting on impulse- wait for the right time. Compassion and kindness are keys to successfully manifesting your dreams. Forgiveness also brings healing which allows for new beginnings. With confidence and certainty you’re passionate about anything you take on. This is your golden time of celebration and success. Use all that you have done to create a blue print for the future. Patience is required. Explore possibilities on how to promote your business or talents. A significant situation requires your full attention- channel your inner wisdom and proceed with caution. Possible sudden passionate love affair, business travel, or change of residence at this time.